Everyone is always looking for the speakers for sound so they can enjoy music and games better. 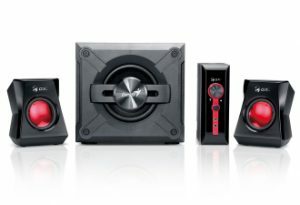 Here we will look at the best 2.1 speakers in these reviews and let you decide which ones are best for you. 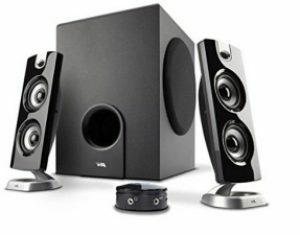 Whether you are looking for the best 2.1 computer speakers or for something else, you will surely be able to find what you’re looking for in this post. Immerse yourself and the whole room in spectacular sound with these speakers from Logitech. Enjoy your music and games the way they should with clarity and a nice, deep bass. 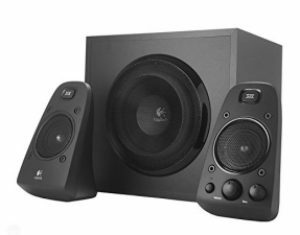 This system comes with the subwoofer and two satellite speakers, which is more than enough for any average sized room no matter what you are doing. RCA and 3.5mm inputs allow you to hook it up to your computer, iPod, DVD player and gaming system, just to name a few. On-speaker controls for volume and bass allow you to control the sound to how you like it. If you like a lot of bass, turn that baby up and listen to it how you want to. This system is great for just about anything. Hook it up to your gaming console and immerse yourself into the game as if you’re in there or hook it up to you iPod for a great party, you won’t be disappointed. 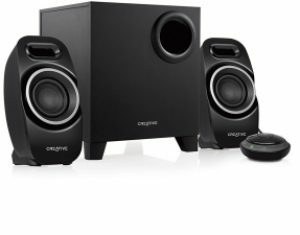 If you’re on a tight budget, this little system is worth a look as they are in the low price range for 2.1 speakers. It comes with a side-firing subwoofer and two satellite speakers in a flat panel design. It has a cool look to it. It also has what is called a system control pod where you control everything, volume and bass, an on/off switch, it even has a headphone jack and this is where you will find your aux input jack also. The system is good for movies, music, computers and gaming consoles. Out of the box, you may need to mess with the settings a little to get it to sound good, some had issues with it right out of the box, but once they messed with the controls, they loved it. The only real complaint about this system is that the satellite speakers are said to be a little top heavy and they can easily be knocked over, so they should be situated in a spot where they won’t be bumped. Other than that, most love this system from Cyber Acoustics, it’s definitely a great buy if you’re on a budget, without the budget sound. 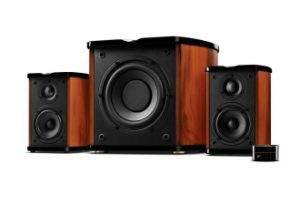 This 2.1 speaker system from Klipsch is a good system for any computer with high-quality sound and a nice bass. Included in the box is a compact set of speakers that consists of the subwoofer and two satellite speakers. These satellite speakers fit nicely on the corners of your desk and don’t take up a whole lot of room. There is a convenient headphone jack for when you want to listen in private and two dual analog inputs for your portable audio device like a mp3 player or even mini disc players. The controls are nice and easy to adjust and the sound is just great. If you watch movies or listen to music on your computer, you will love it. It also sounds great with online games, it really immerses you into the environment and everything going around you in the game. The only negative comments on this system isn’t really a big negative, the satellite speakers are lightweight and some complained they were easy to knock off their desk if the desk is bumped hard. Like I said, not a big negative, overall this got good reviews. If you’re looking for a good 2.1 speaker system for your computer but don’t have the budget to splurge, this system from Cyber Acoustics is perfect for you. Considering the sound quality that comes out of this little system, it’s a steal for the price! 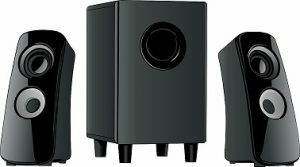 The computer speaker system comes with the side-firing subwoofer and two flat panel design satellite speakers, it really does look cool and more modern than the standard sets you see out there. There is also a control pod where all your controls for master volume and bass are located as well a headphone jack, aux input jack, and the on/off switch. This system will blow you away with the quality of sound coming out of it as if it were one of those high priced systems. 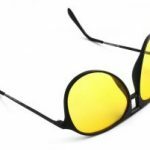 Use it with your laptop, desktop computer, gaming console and any other multimedia devices and immerse yourself. Creative has been around for a while with making computer speakers, long before all the others. 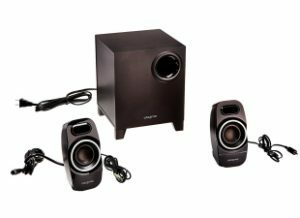 This is a simple, but good 2.1 computer speaker system for a very nice price. It includes the subwoofer and two satellite speakers and the satellite speakers have a small footprint so you don’t have to worry about them fitting if you don’t have a large desk. It does have an on/off switch and an easy to use the volume control. This nice little system will work perfectly for your desktop computer or even your laptop so you can listen to music, watch videos, watch movies and play online games. Don’t let the price fool you, the price may say cheap, but the sound quality coming out of these doesn’t. The only thing lacking in these as compared to others is that it doesn’t have a headphone jack. This is a very nice system by Cyber Acoustics and it’s at a great price. This is perfect for all of your multimedia needs, whether it be to listen to movies, watching movies or gaming. The three-piece system comes with a 6.5″ side-firing subwoofer that will blow you away and two angled satellites. It also comes with a convenient control pod that controls the master volume and bass. The control pod also has a headphone jack an aux jack for other devices. The subwoofer and satellites also have removable cloth grills that are easy to clean, so keeping your system speakers dust free is much easier. 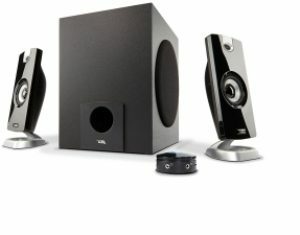 This 2.1 speaker system immerses you in the sounds of whatever you are doing, it has nice clarity and a nice, deep bass. You can watch your favorite movies, listen to music and even play games while enjoying the sounds from this system. This is a nice and interesting looking 2.1 sapker system from Genius. 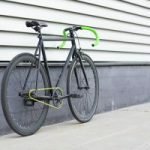 It has a bold look that will surely get it noticed and it has a nice sound also. This system comes with the subwoofer, two curved satellites with hook design and a control box. Because of the curve and hook design, these satellites can be wall mounted so they don’t take up desk space. The control box allows you to adjust the volume and bass of your system and has headphone/microphone jacks. 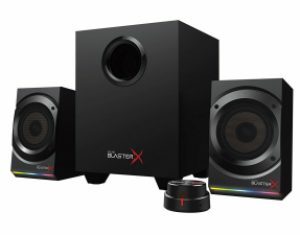 You can easily use this system for watching movies, listening to music or other multimedia things on your computer, but this system seems to have been created with the gamer in mind with looks and sound. It may have a budget price, but it doesn’t have a budget sound quality at all. Nice quality sound and a nice, deep bass. If you’re looking for a system to add to your online computer gaming, look no further than the Kratos, you will just be amazed. This 2.1 system was created with gamers in mind to further your gaming experience and to also look cool. The system comes with a 6.5″ subwoofer, two 4″ satellites and a control pod. The cool thing about this system is that the satellites have the Aurora Reactive Lighting system, which means they light up just like your RGB gaming keyboards to add to your experience whether it be gaming or music. The control pod allows you to easily adjust the sound and also has convenient jacks for headphone and microphone. You can also use the dual RCA to stereo adapter and hook this up to your DVD player or LCD TV. The sound from this is just awesome, it will really immerse you into whatever you are doing from any angle. Crisp and clear sound quality and a nice, deep bass make this a great system for any gamer. This is a nice system for those that like to use Bluetooth devices. 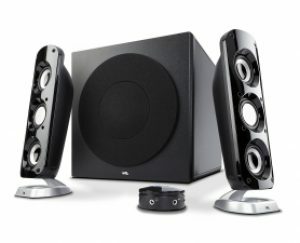 It is a nice system, it won’t blow you away like higher priced systems, but it’s good for those of you that are looking for a basic speaker system for your computer or Bluetooth device. The system comes with the subwoofer, two satellite speakers, and a control pod. The control pod has an on/off switch, Bluetooth control, and volume control. Now some people were confused and thought the satellites were Bluetooth and they could put them anywhere, this is not the case, the satellites connect to the subwoofer as any other system out there. The Bluetooth is to connect to your system with a Bluetooth device or phone. This is not a bad system for the price if you’re looking for something that will work with your Bluetooth devices. The only negative I can see is that there is not an individual control for the bass, that you will have to use the controls of whatever you have the system connected to, other than that it’s a good system. This 2.1 speaker system by Swans was made for those who love to listen to music. This isn’t just for computers, you can hook it up to gaming systems and even use it for your stereo if any of you still have one of them. 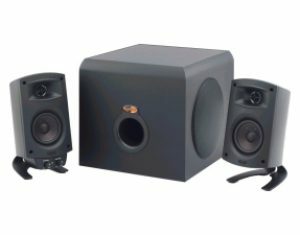 This high quality, classically designed powered bookshelf speakers system comes with the subwoofer, two satellites, and a little dial control box. The subwoofer and satellites have a classic wood design, sure to look nice in any room. Tap the dial control to turn the sound on or off and spin it to control the volume, they make it nice and easy. It has a nice, deep bass and a high-quality sound. This system was made for those who just love to listen to music in a nice, rich quality, for those who really appreciate music. You can still use it for games and other multimedia stuff, but it was those of us out there that just love music. I found this Genius SW-G2.1 playing at a mall and it lightened up the atmosphere of the whole mall. They are beasts!